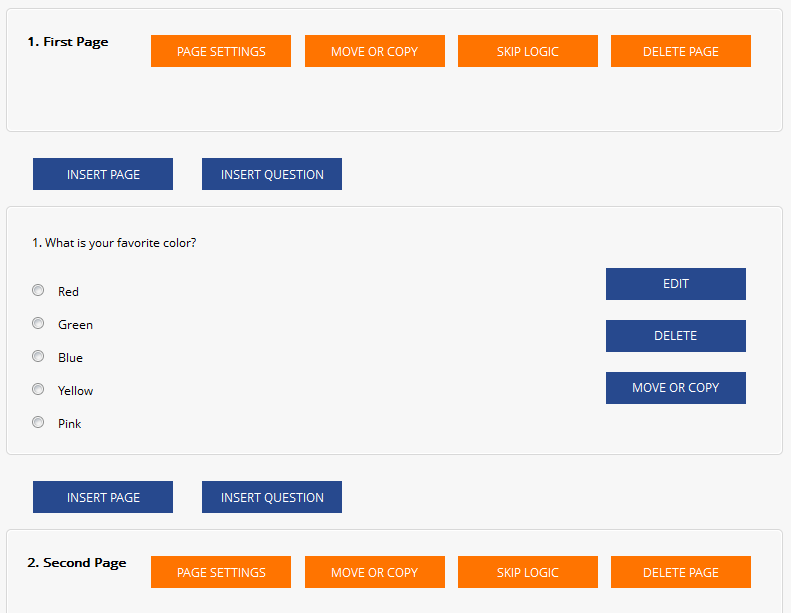 Page logic can be added to a page while editing the survey by clicking on the “Skip Logic” button in the title bar for the page. 1. Unconditional Jump – go directly to the next page. This option is the default options and it just turns off the page skip logic. 2. Unconditional Jump – upon exiting page, jump to a specific page. 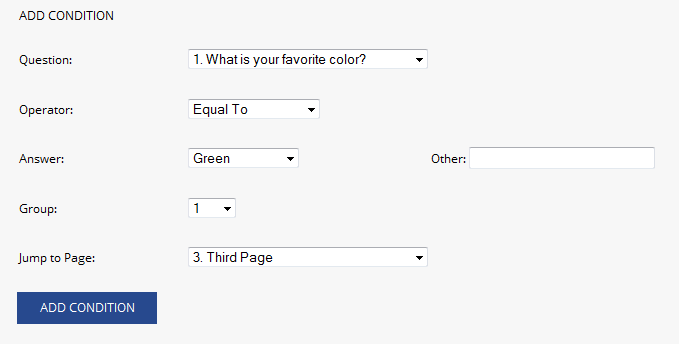 This option will send the respondent to the specified page upon exiting the current page. It does that unconditionally with no regard to any other criteria. 3. Conditional Jump. This option lets you create a set of conditions that determine what page the respondent should be taken to based on how they answered one or more questions on the current or previous pages. In this example, we would like that respondents that are choosing “Green” to the first question, should only respond to questions on Page 3 and then the final page (Page 5). Also, respondents that are choosing “Blue” to the first question should only respond to questions of Page 4 and then the final page (Page 5). Note that each condition was placed in a separate “Group”. Group numbers are used to group together multiple conditions that must all be met. In our example, we are controlling the survey flow based on one question and therefore each condition is separate and in fact, only one condition can be met at a time because the user can only have chosen one color. With these conditions set, when respondents exit Page 1, the page logic will determine what page they should go to next based on their answer to what their favorite color is. Now that we have set up the logic to control where the user goes to after Page 1, we need to add page logic to pages 3 and 4 as well. The reason is we only want the respondent to complete the page corresponding to the color they chose. For example, if they choose “Green”, they will be taken to Page 3. However, when they finish that page, unless we add page logic to it, they will move on to the next page (Page 4) and then to the final page (Page 5).